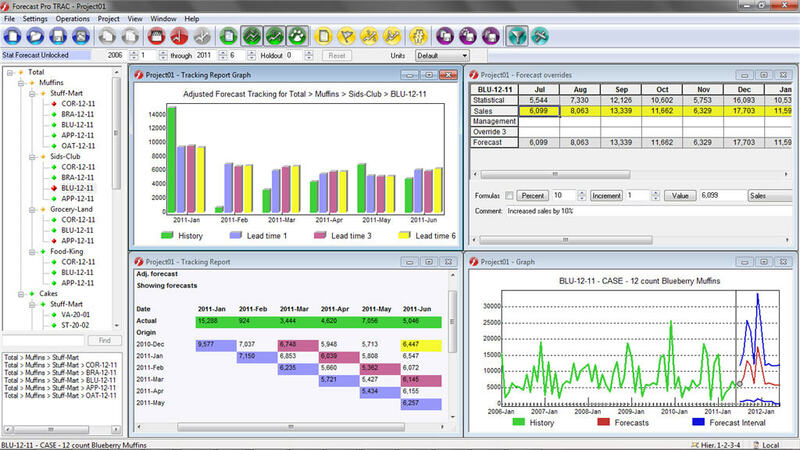 Forecast Pro TRAC is a comprehensive demand / sales forecasting and Sales and Operations Planning software solution. This affordable and easy-to-use solution gives your team the capability to collaborate to create accurate and credible forecasts for 100s or 1000s of items, along with the tools for efficiently managing, monitoring and improving your forecast process. Designed specifically for business forecasters, Forecast Pro has an intuitive interface that displays hierarchical data in a tree-like structure, allowing you to work at any level of detail with a simple click of the mouse. 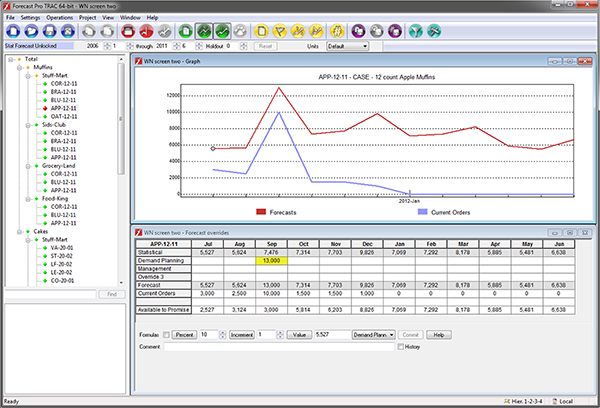 As you navigate from item to item, synchronized windows displaying graphical and tabular reports are instantly updated. Sharing your work is easy with Forecast Pro’s flexible output formats, including one–click, direct–to–Excel reporting. Forecast Pro’s automatic “best pick” feature allows you to generate accurate forecasts, even for thousands of items, in a matter of seconds. 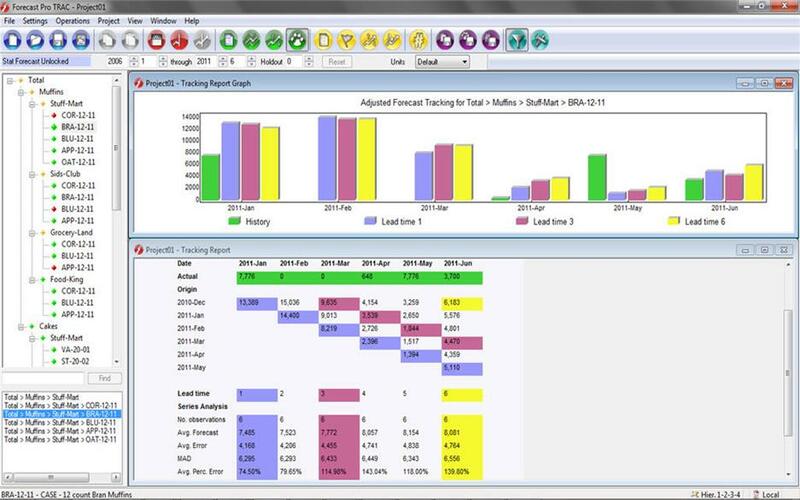 If you prefer to specify the forecasting approach, Forecast Pro provides menu-based custom modeling options and a comprehensive set of diagnostic tools. Forecast Pro makes it easy to collaborate with others to establish the final forecast. Members of your team can add their business judgment directly using the software’s spreadsheet-style override facility, which features up to ten customizable rows. You can adjust single points, ranges or totals, using percentages, increments or by simply entering new values. Adjustments to the forecast can be made at any level in the hierarchy, and all changes are automatically reconciled. Handy comment fields make it easy to document changes, and override reports provide transparency to the process. Forecast Pro allows you to view your data and forecasts in any units of measure you wish. A simple drop-down menu lets you instantly switch among those units of measure that are important to your business–such as dollars, units sold or pallets. 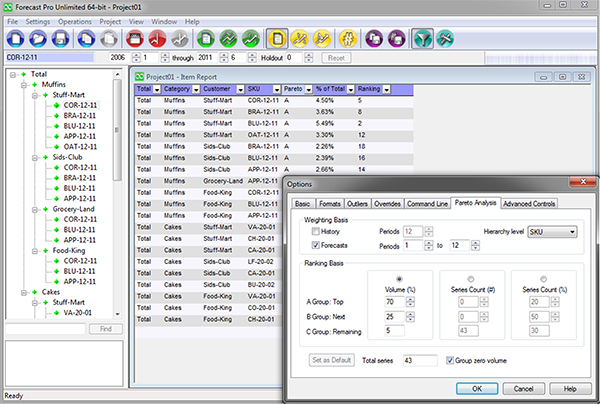 With Forecast Pro’s powerful “shuffling” capability, you can rearrange hierarchies on the fly. For example, you may be working on your forecast in a product-by-customer view and then instantly change views to work with customer-level forecasts broken out by products. The software maintains an archive of your previous forecasts (both statistically–generated and adjusted forecasts) so that you can compare and contrast previous forecasts to what actually happened. With just a quick glance at Forecast Pro’s “waterfall” reports you can zero in on what’s working and what isn’t. Forecast Pro allows you to break large forecasting projects into smaller pieces that can be worked on separately and then reassembled into consolidated forecasts. For example, if three demand planners are responsible for forecasting three different geographical territories, they can work on their forecasts separately; after they’re done, their consolidated forecast can be viewed and further manipulated. In addition to generating a statistical forecast, Forecast Pro allows you to import multiple forecasts into the forecast worksheet (i.e. from other parts of your organization or partners) and to specify which forecast serves as the “baseline” on an item–by–item basis. You can then combine multiple forecasts to create a new forecast consistent with your organization’s S&OP or other established process. Work with any information you need. 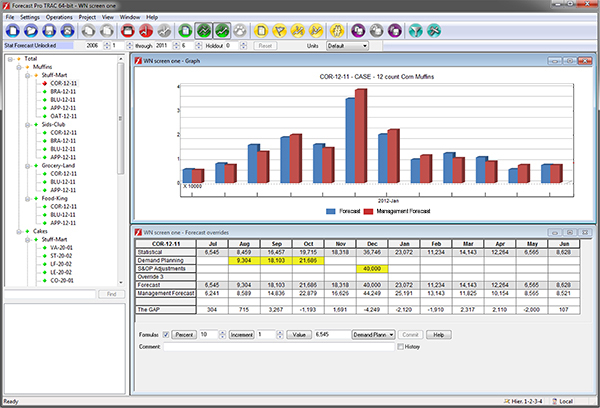 Forecast Pro allows you to bring other pertinent information into the forecast worksheet–such as current orders and inventory–and to create new rows which are calculated based on the values of existing rows (including forecasts and other imported information.) You can then design customized planning and S&OP worksheets addressing your specific needs. Some forecasting processes require certain forecasts to be “frozen” or locked in for a period of time during which changes are simply not allowed. Forecast Pro allows you to set time fences–on a global or item–by–item basis–to prevent users from changing forecasts during these “fenced” periods. When you update a forecast project with next period’s data and create new forecasts, the fenced values from the previous forecast remain locked in. Forecast Pro maintains “Forecast Projects” which allow you to easily update your forecasts from one forecast cycle to the next and to maintain a record of all your forecasting sessions. Forecast Pro TRAC Collaborator licenses provide an easy and affordable way to collaborate with colleagues. Offered at a fraction of the cost of the Forecaster licenses, Collaborator licenses allows others to view your forecasts including graphs and reports add overrides and comments, and save the results.